This desert cardinal is known for its bright colors and its beautiful voice. 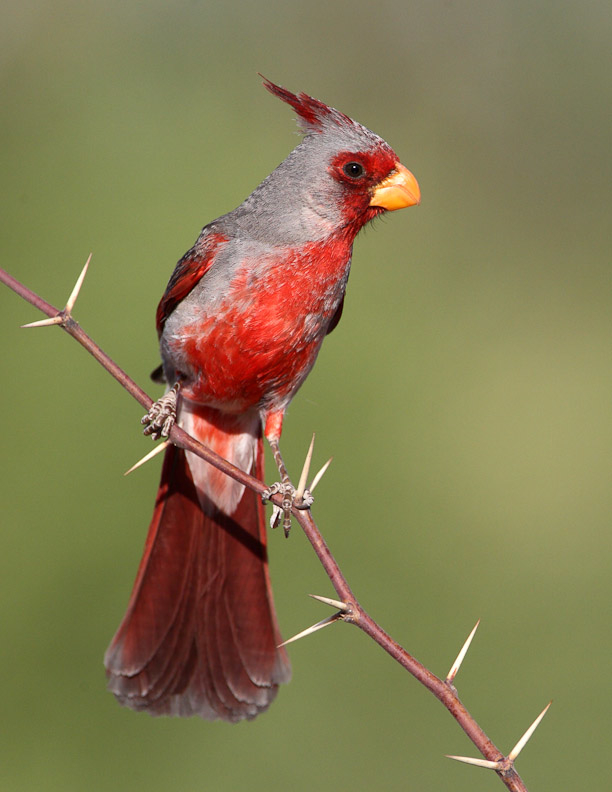 They are closely related to the Northern Cardinal but are normally only found in the southwest. Pyrrhuloxias are a year-round resident of southern New Mexico, Arizona and southern Texas. The Pyrrhuloxia's name comes from Greek terms describing its color and the shape of its bill. Pyrrhuloxias are also called Desert Cardinals and Western Cardinals. Pyrrhuloxias are members of the Cardinal family. The Pyrrhuloxia male has a red-tipped gray crest, gray head, back and upperparts, red washed face and breast and pale gray underparts. The tail is red and the underside of the wings is usually red. The female is duller with less red. While the Desert Cardinal resembles the Northern Cardinal, the Desert Cardinal has a yellow bill and the Northern Cardinal has a red bill and is redder overall. Where both the Pyrrhuloxia and Northern Cardinal breed, territories of the two species may overlap, and no conflicts have been recorded between the species. They prefer desert brush, especially along arroyos and may also be found in town. Desert Cardinals like to eat black oil sunflower seeds, peanuts, no-melt dough, fruits, berries and insects. The favored feeding position of Pyrrhuloxia is on a flat area, such as a hopper feeder, tray or on the ground. They will cling to a feeder to get some of their favorite foods, peanuts or Bark Butter Bits. They are also attracted to mealworms. Pyrrhuloxias will visit feeders at any time of day, but are typically the most numerous at dusk or dawn and are often the first and last birds at the feeders. They are more likely to be seen in the winter than in the summer while they are nesting. Flocks of Pyrrhuloxias in the winter are common. Desert Cardinals are monogamous and a solitary nester. They lay 3-4 eggs in a nest made of thorny twigs, weeds, grass and bark pieces, lined with rootlets and fine materials. Eggs are incubated by the female for 14 days. The male feeds the female during incubation. Pyrrhuloxia combines words meaning “fire” and “crosswise,” the latter referring to the bird’s beak. Pyrrhuloxias are found in the American Southwest, where the range overlaps with the more widespread Northern Cardinal. Female Pyrrhuloxias rarely sing, whereas Northern Cardinal mates often sing duets together. Startled Pyrrhuloxias rely on nearby cover as they are not strong flyers, which they reach with an undulating flap-and-glide flight.